It's lilac time here in New Jersey, and their sweet perfume is everywhere! In fact, as my husband and I go on our daily walks, the air is thick with several different scents -- lilac, sweet olive, honeysuckle and lily of the valley. Also for Photoshoppers, I used an action called Waiting on these photos. I think it was part of a giveaway from Wish Photography. You can find their Facebook page here. I'm still having problems with my hand, so I have been an absent blogger for the entire week. :( I'm hoping that some more rest will help. In the meantime, I'm enjoying the beautiful month of May! 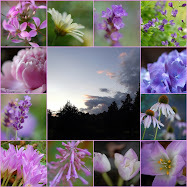 Mary, I love your pretty lilac photos. Their scent is heavenly. Beautiful photos and mosaic. Thanks for hosting, have a wonderful week! 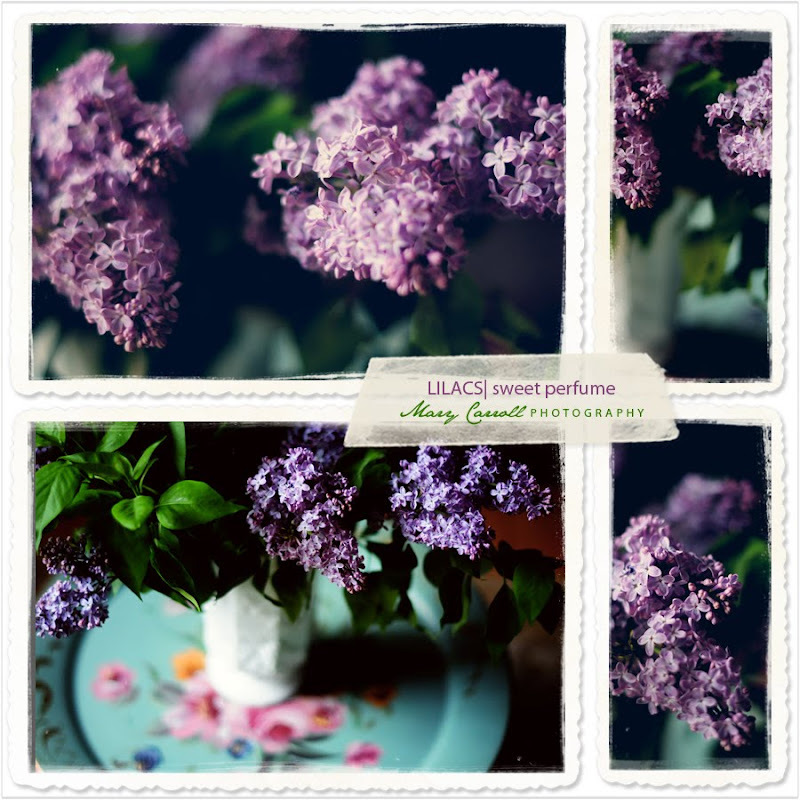 Gorgeous lilacs~ I can practically smell them from here and I love your template! I love your lilac photos - aren't they heavenly. They are only just emerging here in our neck of the woods. I do like the new mosaic, although it is busier than the old simple style. By the way, you don't have a title for your post and it makes it hard to link back to your specific post. Thanks for hosting the giveaway. It's so very pretty...but are we seeing the whole mosaic? I love your beautiful mosaic! Happy May! Beautiful shots! Lilacs are one of my favorites. Mine are almost gone, yours are just stunning. Have a great week! Beautiful flowers, love the color. Oh how I love lilacs and I do like this mosaic template with your lilacs. Hope your hand will get better soon! I love lilacs, can almost catch their sweet perfume through your photos. Your new collage program looks quite nice! Mary, Lilacs are the one flower that can leave me weak in the knees! I love their fragrance and their colors. I look forward to their blooms every year. So glad your lilacs are at their peak. Ours are long gone. I do wish your hand was coming along better for you. That is an ok template but Mary what you put up is always inspiring and beautiful. I love lilacs and can't grow them here. I'll have to enjoy yours! Hope the hand is much better soon. Thanks, as always, for hosting! Oh I wish I could grow these down here in Georgia!! I can almost smell them through your wonderful photos!! Lilac flowers are so pretty and smell so good! I love to grow one around my house one day! You're giving me a sniff of what I can look forward to later this spring. I do love lilacs and your mosaic is lovely, Mary. Sorry to find that your hand is still not feeling so great. Rest is the best thing...hope that you're getting lots of help at home, too. Funny how the entire Eastern seaboard is almost in the same weather zone this year. Our lilacs are blooming as well. Hope that you haven't had all the rain that we have had further north, though. Enjoy those walks! Your lilac mosaic is so pretty - beautiful flowers! I did not have anything to contribute this week - out of town family here, but wanted to say "thanks bunches" for hosting again this week. I've been missing you, dear friend! Was excited to see your post on my blog alert!!! Lovely photography and like the new look! Take care of yourself, dear one. What a perfect time to rest in the beauty of the Season! Mary, yet another beautiful mosaic! And leave it to you to find such a special and unique collage website to add to the magic. I'm so thrilled we managed to get a small portion of lilacs to finally bloom after all the frost damage. Tomorrow I planned on bringing a bouquet inside to enjoy! Enjoy all of the wonderful scents happening in your neighborhood, consider it as "scent-therapy" and maybe that hand will get to feeling better!!! I love the scent of lilacs, Mary, and your mosaic of them is beautiful! I'm sorry to hear your hand is still hurting you--hope it feels better soon! Beautiful mauve shade of lilacs. Ours should start blooming within the next week or so and I can hardly wait for their heady scent. Oh, how I love lilac! I love lilacs, too! And that's a great template. I can really smell those lilacs! And your photos are beautiful. Thank you so much for continuing to host this party. I've learned so much from creating collages. Lilac time is the best time..... Lovely mosaic. Stunning photos - and I love your mosaic template - it works so well. Everything about your mosaic is perfect. Lilacs are my favorite flower in Spring. The aroma of Lilacs is always so lovely. I hope that your hands are better soon. Spring is especially difficult for pain in joints. Lilacs sure are wonderful, beautiful to look at and and the scent is lovely. Beautiful mosaic as always. Hi Mary, Sorry your hand is still giving you problems. Hope you're up to speed soon. I love your new template. The photographs are stunning of the lilacs so of course the template would be. I think the design you are using is very appealing and catches the eye Thanks for the photo info and web sites. Lovely pics of lilacs - I can almost smell them - mine here in Ohio didn't bloom as well this year. Thanks for sharing. Love, love that Lilac! Gorgeous! The lilacs are beautiful. We usually get to enjoy them around Mother's Day too, but our very mild winter/early spring means the lilacs have long gone. I love lilacs but I can't grow them here. beautiful mosaic. Such lovely lilacs. I only have one, about the same color as your first image. I wish I had room for more. I'm thinking of one of the miniatures. Your lilacs are gorgeous...My lilacs have but one flower on them this year and I am not sure what is wrong but I suspect they are not getting enough sun...time to move them? Ahhh the scent of lilacs my favorite Spring flowers! Love the look of this mosaic! Thanks for sharing the link. Wishing you an Happy Mothers Day this weekend! Mary, I cannot seem to post on your blog. I've tried a couple of times and it won't let me so here goes a third time. I hope it works. But of course I like your mosaic. I love everything you do! I need to go back over your posts to see all that I have missed. And yes, May is a lovely month. It's getting warmer and warmer out here in California..but I love it. Everything is growning blooming and that's always wonderful. Oh, I do like your collage very much! And those lilacs are scrumptious! Wish we could grow them like that here in the South...right now we have our gardenias and magnolias blooming which are almost as decadent! I hope your hands gets better soon. Enjoy the beautiful spring that May brings. Oh, Mary! How did I miss these beauties from Monday? And I love this pretty template! Raninculas are beautiful -- I hope there will be some still in Oregon when we get back (I think they're yet another Spring flower that doesn't bloom in hot Florida). I hope your wrist and hands get better (carpal tunnel? )....it is very kind of you to continue hosting this meme and posting your beautiful pictures when you're not quite yourself. Take care -- rest!